Have you just bought a new pair of wheels for racing bikes or MTB? Are you thinking of buying it in the coming months? Remember that once mounted on your bike, all types of wheels need a period of running-in. In this article we look into this further and why it's important not to forget. Buying wheels for racing bikes or MTB: The objectives is to increase performance and reliability. When a cyclist chooses a pair of wheels, he normally tries to buy what he considers the best wheels for racing bikes or MTB. This practice is obviously correct for those who want to practice road cycling or mountain biking at high levels, but also for the cyclist who plans long rides in safety during the weekend. It's natural to assume that you want to try to avoid breakage or malfunction during one of your (maybe few) moments of leisure weekly rides. You can say then that the search for top performance and the need to have reliable equipment is what you should push towards buying high-end products, such as Ursus wheels. But buying top cycling wheels of the range is enough to achieve lasting performance? Read the next paragraph: we'll explain why it's not like that. Do you want long lasting performance for your wheels? Then ensure you carry out their running-in! Buying high quality wheels does not guarantee durable performance, as each mechanical product is subject to the settling and wear of its components. The care and maintenance of the wheels is therefore fundamental. Why? We know that you are thinking of buying new wheels for your bike: you will surely know that the purchase of a quality product requires an economic investment. This investment should be theoretically rewarded by a subsequent improvement in your cycling experience. 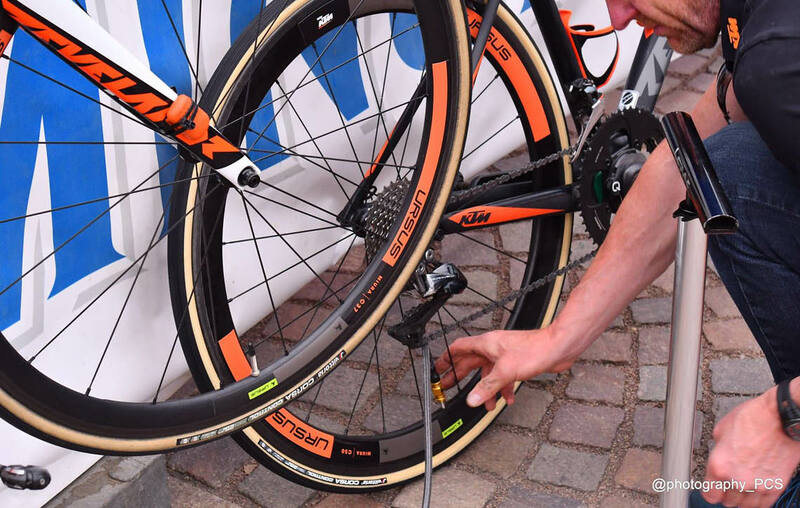 If, however, once you buy your carbon wheels do not carry out the right running-in period, you risk running into a series of limitations that would make your effort less effective. To make the most of the different components with which the wheels are built, they need a normal settling time. So the break-in becomes a fundamental step to enjoy the 100% of your investment. Continue reading to know how to perform a proper running-in for your new wheels. The running-in phase is mainly used to allow the different components of the wheel to settle down. It is the case for example of bearings, elements that ensure the smoothness of the two hubs. During the production phase of the wheel, the bearings and their rubber protections are greased with the aim of reducing the friction of the hubs to the maximum during the pedal cycle, but it is normal to feel them a little stiff at the first pedalling. This is because the grease on the bearings is not yet evenly distributed. Do not worry, just a running-in of around 40-100 km is needed to recover the maximum smoothness of your new wheels. Normally, with the running-in it is also verified that the tension of the spokes remains constant while riding for kms and therefore that the wheel continues to be perfectly centered. If you have purchased or plan to buy a pair of Ursus wheels, it is important to know that you do not have to worry about any tension decrease. This is because Ursus carries out a tensioning adjustment action on all its products: the wheel is slid onto a special machine while a 4 atmospheric piston performs a series of constant stresses on both sides of the rim. Then the tensioning is checked once again: if it is modified or lower than the optimal tension (Ursus indicate it in the user manual of the products) the wheel is re-tensioned and checked once again. This step allows your wheel to settle, avoiding unpleasant drops in stiffness once on the road. Ursus always recommends carrying out a series of braking tests in different conditions before proceeding with the normal use of a new pair of wheels. The new brake pads must be stressed to check their initial performance, especially on the braking surface of the carbon wheels. This step is necessary to be prepared in downhill or near a possible danger. We remind you that an optimal performance of the brake pads is fundamental both for your safety and for the protection of the carbon rims. The running-in of the wheels for racing bikes and MTB: why it's important and how to do it. In this article we have tried to explain to you why Ursus recommends this essential settling phase and we have also seen which are the most relevant components involved. We can conclude by saying that a normal running-in period can last between 500 and 1000 km, but in any case, never stop taking care of your bike. Proper maintenance, as you have certainly understood, ensures lasting performance and reliability.